This issue is noteworthy for a couple of reasons. Firstly, we see Diana return to Paradise Island and become involved in a battle between her Amazon sisters and the Gods of Olympus. 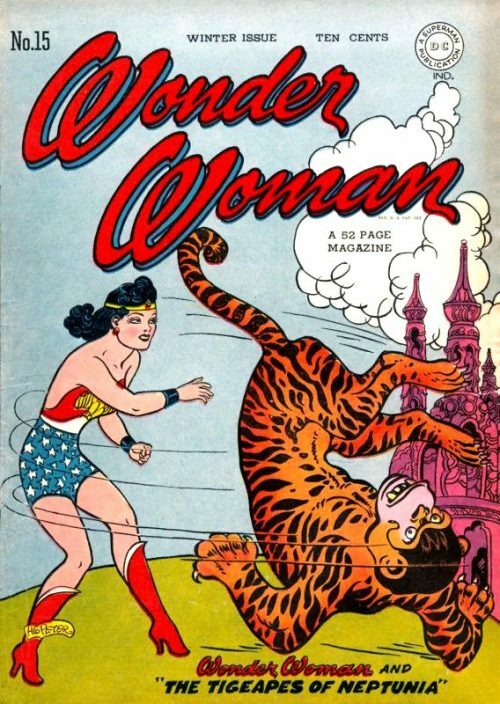 I am unsure why, after the last few issues of sixties “mod” storylines, the creative team decided to switch back to a more traditional Wonder Woman scenario. Perhaps this was always part of the plan – to ease the transition for those loyal fans of the Amazon Princess who found it hard to accept that this “Emma Peel” wannabe was still their Wonder Woman. 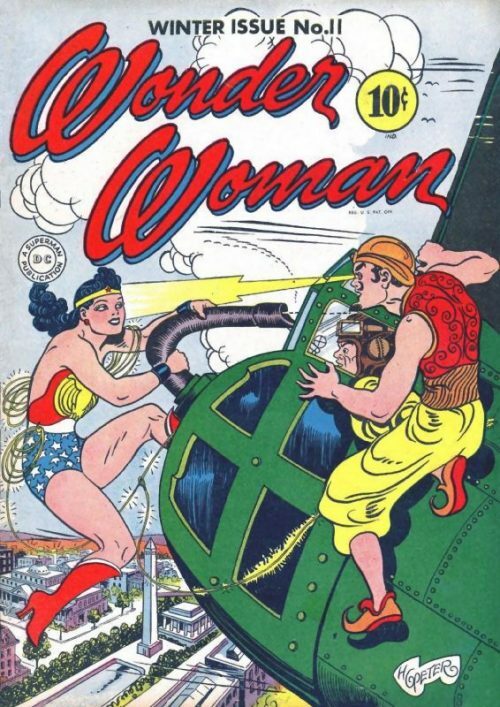 Maybe there had been more negative feedback from readers than anticipated and this story was perhaps a “peace offering” to show that not everything from Wonder Woman’s past had been thrown away. Either way, it is nice to see Queen Hippolyta, Paradise Island and a Diana who looks and acts like an Amazon Princess and, more to the point, a Wonder Woman! Secondly, it is revealed that Ares is Hippolyta’s father! This fact seems to have come out of nowhere as it was never referenced in any previous issue featuring the God of War, at least to my knowledge. Ironically, as part of the New 52 re-boot Diana’s own origin would be retconned and she would become the daughter of Zeus, with Ares becoming her uncle and mentor! After running through the streets of London for what seems like forever an exhausted Diana finally stumbles to the ground. As the weeping Amazon tries to get back to her feet she cries out that being human hurts so much. Suddenly she hears a female voice call her name and looks up to see an Amazon dressed in full warrior armour standing over her. A surprised Diana asks her sister what she is doing here. The Amazon replies that she has come with a message – the Amazons are at war and Paradise Island has been invaded! Diana is then shown her mother’s ring and told that the Queen begs her to come home because she is desperately needed. Diana agrees without hesitation and just then sees I Ching arrive on the scene. After asking every policeman between here and the mansion house if they had seen a distraught girl running through the fog, he had finally caught up with her. He asks if there is trouble and she tells him that Paradise Island is under attack and she must go back to aid her mother. I Ching says that he will accompany her and together they are led by the Amazon warrior back through the mystic portal to the dimensional plane where Olympus exists. They arrive to find a terribly changed Paradise Island. Its loveliness has been destroyed – scarred by death and destruction. Diana asks where she can find her mother and the Amazon indicates the Temple of Athena ahead. 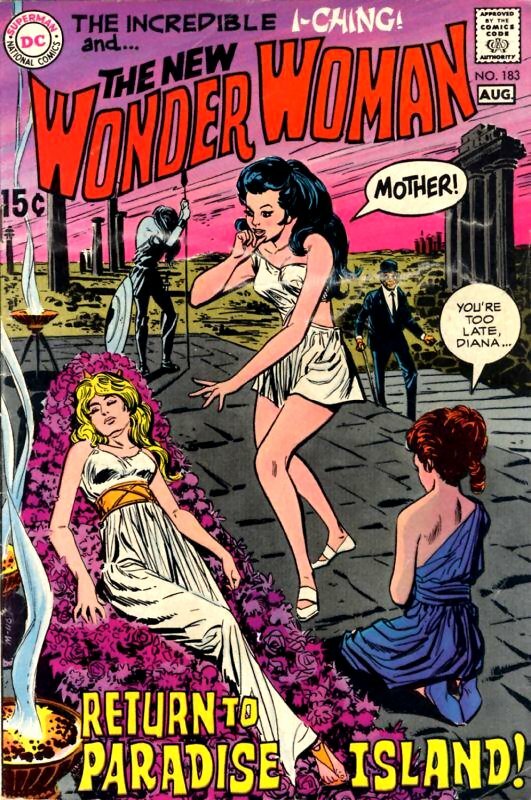 The Amazon Princess rushes inside and is horrified to see Hippolyta lying motionless on a bed of flowers. The distraught Diana crouches by her mother’s side and weeping, hugs her mother whom she presumes is dead. The Oracle who has been attending Hippolyta explains however that Diana’s mother is not dead but lies in an enchanted sleep. Diana asks who has done this to her and she is told that Hippolyta’s father, Ares, God of War, wants to know the secret of Dimensional travel. He, together with his blood thirsty sister, Eris and his loathsome sons Diemos and Phobus have gathered together a mighty army. They wish to bring war to Earth but before they can do so they need to know Hippolyta’s secret knowledge in order to travel to Earth. The Oracle recounts how Ares and his entourage had arrived at the palace, demanding Hippolyta reveal the secrets of dimensional travel. The Amazon Queen had told Ares that the secret was entrusted to her by Zeus and she would not betray his trust. She knew the God of War planned to bring bloody conflict to Earth which had already had more than its share of wars. An enraged Ares had retorted that War gave him power and if she would not reveal the secret he would take it by force! Ares’ army had then attacked in hordes. Hippolyta and the other Amazons had fought like furies as wave after wave of the enemy crashed against the wall of Amazon shields and broke under Amazon swords. But even Amazons tire and finally, driven back to Athena’s Temple, a final terrible battle took place resulting in the Amazons’ defeat! Ares had demanded the Queen now reveal the secret but once more she steadfastly refused. As Ares raised his sword in anger Eris had suggested another course of action. She had used her magic to send Hippolyta into a deep slumber – gentle at first – but one that would change into a terrible nightmare, filling her mind with the frightful, fearsome and unspeakable! Hippolyta would writhe and twist in an agony of hopelessness from which she could not awaken. Only the revelation of the secret would release her from her torment! And thus the Queen had fallen into a deep coma from which they had been unable to waken her from since. 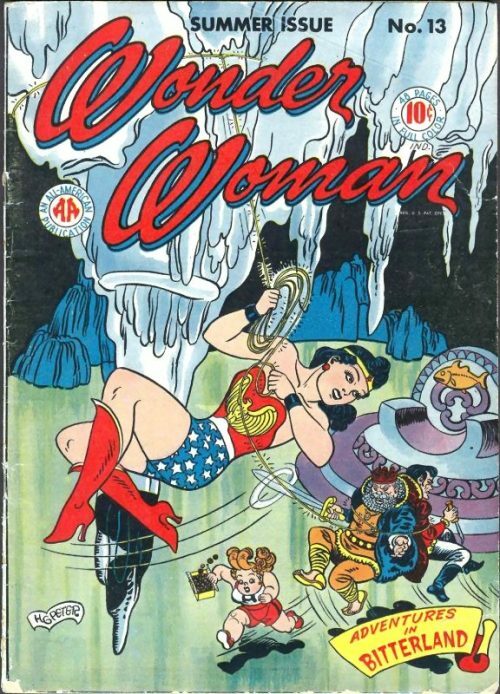 Suddenly Hippolyta lets out a scream and Diana tries to calm the writhing Amazon Queen in her torment. Just then Ares arrives and smirks that her mother seems to suffer greatly. Diana asks him how he can do this to his own daughter. He bellows that what he does, he does for Olympus. Too long have the old Gods slept! They must awaken and rule as they once did. He, Ares, will make the Gods of Olympus supreme once more! He then says that Diana can end her mother’s agony by speaking with her and telling her to reveal the secret. The Amazon Princess looks down upon her tormented mother, tears falling down her face. I Ching sees Diana’s anguish and warns her that whatever the personal cost to her, she must not let Ares learn the secret as he will unleash a blood bath upon the Earth. A smiling Ares, surrounded by his sister and two sons, senses victory and tells Diana to hurry as there is no time to lose. What is her answer? As the distraught Amazon Princess holds her mother’s arm she feels Hippolyta grab her own hand and grasp it tightly. She nods in understanding and defiantly turns to Ares – her mother’s answer is NO! A furious Ares orders Hippolyta to be taken back to his camp where he will use other methods to extract the information he needs. But Diana stands up, calmly faces him and tells him he will not be taking her mother anywhere. He draws his sword and holds it above her head but she and the other Amazons, who have now gathered around her, stand their ground. As a result Hippolyta stops writhing and falls into a more peaceful sleep. Realising it is checkmate, Ares tells Diana that he will return soon and this time no puny human will stop him! Eris adds that Diana has only won a temporary victory, as she has only partially broken the spell over her mother. Hippolyta still remains in a coma and can only be released either by Eris herself or until the secret is revealed. As the Gods depart, a stern faced Diana tells I Ching that Ares is right – she is only a human now. What can she do against a god? He replies that she will do what she must – and she will do her best. He continues that although Ares is a God he is an ancient God. As a God loses worshippers his powers diminish and so it is with her grandfather. If he can conquer mankind, people will have to honour him again but he needs to reach Earth to do so. Right now though, he is still comparatively weak and can be beaten. It is up to Diana to lead her Amazon sisters. Diana turns to the other warriors and addresses them. Their Queen, her mother, lies in a coma perhaps never to awaken. 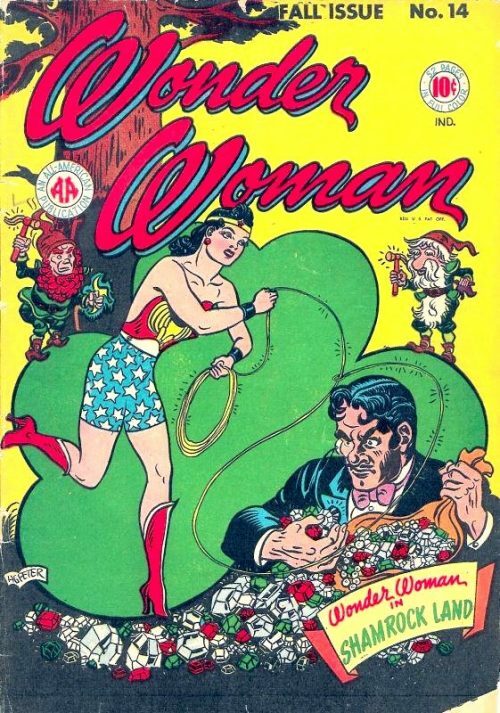 She, the Princess, is now only a human with none of the special powers she possessed as Wonder Woman. She therefore feels it is not her place to ask them to make such a sacrifice. 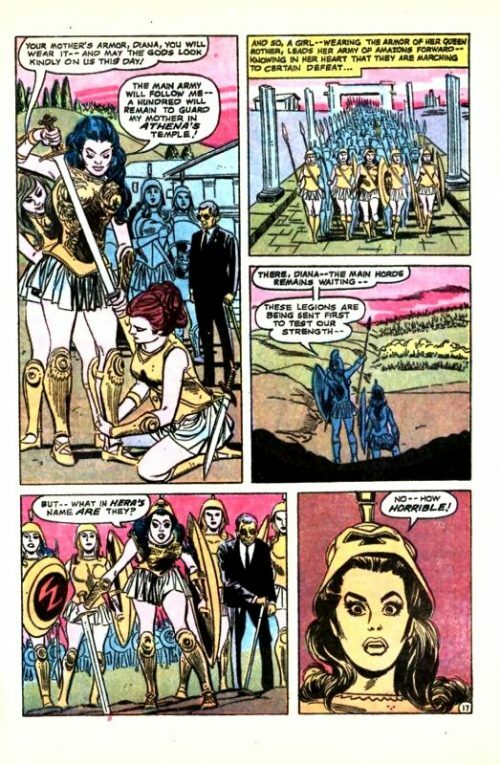 But as one, the Amazons reply that they only wish Diana to lead them and they will gladly fight for her! Diana then calls a council of war and asks her captains what resources they have and what are their chances of success. She is told that they have lost many warriors and their supplies are low. The enemy outnumber them five to one and every day more barbarians from the outer lands flock to Ares’ cause. But in unison the captains defiantly state that they can still win against such odds because they are Amazons! Diana listens to their brave talk but knows deep down that they cannot win – but that they will fight no matter the cost. Just then news reaches the tent that several legions are advancing across the plain towards them. Diana sounds the call to arms and puts on her mother’s armour and equips herself with a sword. She instructs that the main Amazon army will follow her while one hundred warriors will remain behind to guard the Temple. And so Diana, Princess of Paradise Island, leads her army of Amazons forward, knowing in her heart that they are marching to certain defeat. Arriving at the battlefield they see that the main horde of barbarians remain waiting while an advance party is sent to test the Amazons’ strength. As Diana stares at the approaching soldiers she tries to make out who they are. As they draw nearer she is horrified by what she sees. Ares has sent the beast men of Diemos and Phobus to attack them and the Amazons can hardly bear to look at their repulsiveness. The sight of them is so horrifying that armies are normally paralysed into inaction until it is too late and they are overwhelmed. The closer they come the worse Diana feels and only I Ching snaps her out of her stunned state. Being blind, he in unable to see the approaching beast men and so wonders what the matter is. Realising that this is the answer, Diana orders the Amazons to hold their shields in front of the their faces and not to look directly at their attackers. Led by their Princess, the Amazons lunge forward and the beast men are quickly slaughtered! Aroused now to their full fighting fury, the Amazons mercilessly move forward, giving no quarter and asking none. Beast man and Amazon fall until their enemies make a hasty retreat. A tired Diana surveys the carnage around her and knows that while they have beaten Ares for now, how long before they are attacked again? Suddenly a wounded Temple guard staggers into view and weakly murmurs that the Queen has been kidnapped! The Amazons guarding the Temple of Athena had been taken by surprise by Eris’ horsemen. Diana orders the guard and the other wounded to be taken back to the Temple while she and another five Amazons race off. Eris’ horsemen will have to go through the Medean Pass to get back to their camp and if the Amazons can get there first they might have a chance of stopping them. Soon they arrive at the Pass just in time to see the horsemen approach. Waiting for the optimum moment, Diana and the other Amazons launch a surprise ambush as the horsemen ride by and before they know what has happened the enemy lie dead. 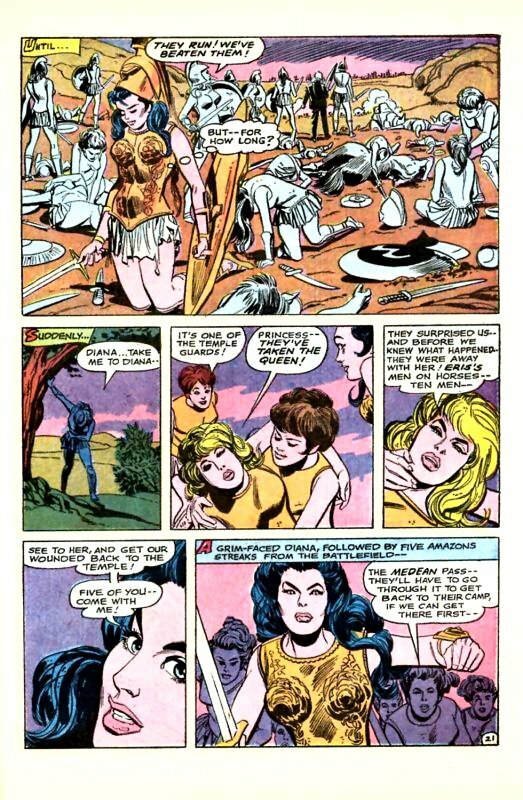 The Amazons recover Hippolyta’s limp body and Diana decides they they are no longer safe to return to the Temple and that they should collect the others and take refuge in the mountains. At least in the narrow passes and canyons the Amazons have a better chance of defending their position. Soon, a long line of Amazons, wagons and horses move towards the mountains to make what will probably be their last stand. They eventually reach a valley high in the mountains and stop to rest. As Diana surveys her Amazon sisters she tells I Ching that they are so brave and yet they know that they cannot win this war. Regardless though, she knows they will fight to the last drop of their blood. She must think of some other way to stop Ares and save them. The Chinese sage suggests that she is tired and should get some rest until morning. But the Amazon Princess, once known to the world as Wonder Woman, replies that there is so little time left before Ares comes and that she must find the answer tonight.